North America: $8.00. Please pay in US funds (postage included). International money order, cash, cheque, or Paypal. International orders: $8.00. Please pay in US funds. International money order, cash, cheque, or Paypal. This is a CD EP featuring John Hamilton and Ian Mackay of The Diodes with Cleave Anderson (Battered Wives, Blue Rodeo, Tyranna). Includes covers of Diodes songs: "Tennnis Again" and "Photographs From Mars"
The Beverley Brothers are Ian Mackay and John Hamilton of The Diodes and Cleave Anderson of The Screwed (and previously Blue Rodeo, The Sharks, and The Battered Wives). The Beverley Brothers take their name from Toronto's legendary Beverley Tavern which fostered the 1970s-80s Toronto New Wave/Punk scene. The Beverley Brothers grew out of The Diodes 30th anniversary reunion as headliners at NXNE in 2007. After NXNE was over, one half of The Diodes, Paul Robinson (vocals) and John Catto (guitar), flew home to Britain. The other half, Mackay and Hamilton, kept on jamming and old friend Cleave Anderson was asked to sit in. The trio decided to record a few "off-the-floor" tracks but the project grew. Tracks were added, mixed and remixed, and engineer Kevin Porter of Art Zone studio contributed encouragement, ideas and additional lead guitar. 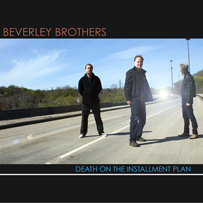 On Death on the installment Plan, The Beverley Brothers revisit two well-known Diodes classics, Tennis Again and Photographs from Mars plus add two new originals (There's Still The Same) Rock and Roll Monkey on My Shoulder and the EP's title tune, Death on the Installment Plan.